As you most probably know, to become an actor you have to become gay first. Well, it only stands to reason, right? That you have to be happy to give happiness in turn. Why? What else were you thinking? Something like this 107-minute film made in 2008, Directed by and Starring Ben Stiller, with Robert Downey Jr., Jack Black, Steve Coogan, Tom Cruise, Nick Nolte, Danny McBride, Matthew McConaughey, plus Bill Hader. The film, ‘Tropic Thunder’, was supposed to be a great depiction of Wartime drama. Directed by the English filmmaker, Damien Cockburn (Steve Coogan), and based on a true-life story written by John Tayback (Nick Nolte), with the special effects handled by explosives expert, Cody Underwood (Danny McBride). But no. As per usual. The actors involved have to f*ck it all up. You see, down on his luck action star, Tugg Speedman (Ben Stiller), can't get along with the method actor, Kirk Lazarus (Robert Downey Jr.), because he is white man playing it black. Literally. Furthermore, flatulent funny man, Jeff Portnoy (Jack Black), is a drug addict, the film starlet, Kevin Sandusky (Jay Baruchel), is very nice, and the rapper, Alpa Chino (Brandon T. Jackson), is... err... a rapper. 'Shape up, or else I am closing you down'. OK, in retrospect, this may appear like a very difficult thing for Damien to do. But can you imagine what happens when he decided to drop these actors in the middle of the Jungle, and set up a guerrilla style shoot, before getting blown up by real life guerrilla’s himself? Yep. Its going to be one of those films. Yet, actors being actors, none of them really believe that this is ‘for real’ so to speak. So they just continue ‘hamming it up’ for the movie, and getting on each other’s nerves, hardly noticing when the guerrilla’s capture Cody and John from afar. In fact, they get on each other nerves so much, that Tugg and Kirk have a another fight. Leaving Tugg on his own in the middle of the Jungle, speaking to his agent, Rick Peck (Matthew McConaughey), on the phone, until the guerrilla’s rear their ugly heads again, and manage to capture him too. Ouch! Pretty bad turn of events, right? So who is going to save Tuff now? Peck, when he receives a ransom on the phone by the guerrillas? No. Not really. But he does try to help; by pleading to Grossman for some financial aide. OK then, so what about the rest of the actors? Kirk, the white man who thinks that he is black? Jeff, who is suffering from drug withdrawal? Or maybe even Kevin or Alpa, as they do appear like very pretty ‘gay’ individuals, don't they? Maybe? And that is why what next transpires is a right dramatic hullabaloo I can tell you. As actors acts – actors fight – actors save – actors shoot – and actors do whatever they have to do to make it out alive. 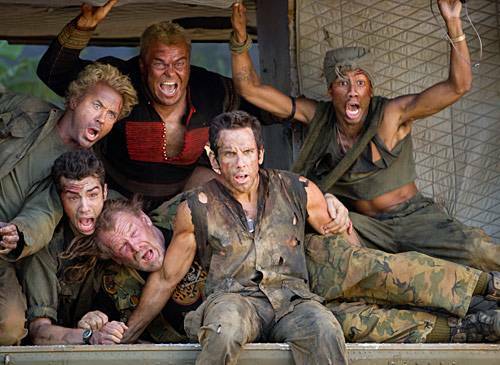 In a good way of course,‘Tropic Thunder’ is one of those films’ that is just pure unadulterated silliness slapped onto celluloid. Granted, the story is sh*t, and the through-line flimflams all over the place as if it was a constipated mule dieing for a dump. Still, what else could you expect from Ben Stiller and company? An in-depth study in nihilism? Ha! Don't make me laugh! Which I suppose is an appropriate phase I can say about this film really. Please note, I do not wish to imply that this film is not funny -- because it is in places. But by in large this is a character piece set in the world of movie making, which is a nice concept that I feel could have been handled a lot better with a more poignant story behind it. OK, I know that what I have said so far does sound rather bipolar in tone. However, that is because this is a movie with both positive and negative attributes to it. So what do I normally do when this factor comes into play? Correct – its time for advantages / disadvantages. (1) Tom Cruise is just brilliant in this movie, and in my opinion, his performance of a money-grabbing b*stard is just out of this world. Also, he is supported by two great aides as well – Bill Hader and Matthew McConaughey – whom likewise do a stellar job. (2) I know that Robert Downey Jr. was in this movie, but because he does such a good job at not being himself – wow – that’s all I can say bwana. Wow! 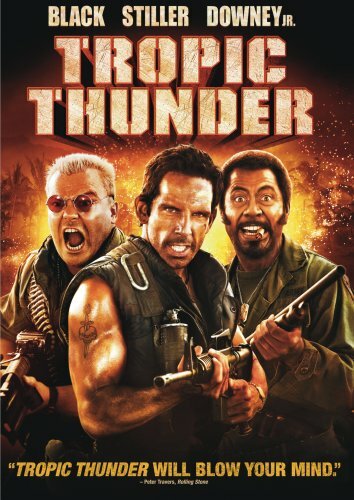 (3) I really liked Jay Baruchel, Nick Nolte, Danny McBride, and Brandon Jackson, in this film. OK, I know that they were all meant to be supporting players. Yet they still managed to stamp their own mark in their own respective ways. (4) The premise of this film is just great -- which is why I am so disheartened with the actual story in itself. And (5) I really did enjoy how this movie begins. This intro was a very original and a very nice way of introducing some of the cast. (1) As I said before, I do feel that the story behind ‘Tropic Thunder’ could have been handled much better than it was. There could have been some more depth to this film, some more meaning to this film, some more growth to this film, and some more point to it too. But no. All it was, was a slapstick film with hardly any direction whatsoever. Sorry Ben. (2) Conceptually, each of the characters in this film are of the ‘one note’ variety. Such as: a white man playing it black – a druggie needing his fix – and a down on his luck actor wanting to make it big again. Too simple, and too ‘tried and tested’ I am afraid to say. (3) I really wanted to see more of Jack Black in this movie. I just found that his role was considerably diluted all in all, and he was only really used as a tool for silly jokes. And (4) In places, the pace of this film did flounder quite a bit – as it had that ‘stop / start’ quality to it where story progression was concerned. OK, so that makes it advantages winning by 5 to 4 -- which sounds about right -- as it was a nice film to watch, just staggered in places, and with no depth of plot. Nevertheless, no matter what I say, it still did well in the box-office, and I hear that a sequel is in the works as well. So better luck next time guys. Fingers crossed.